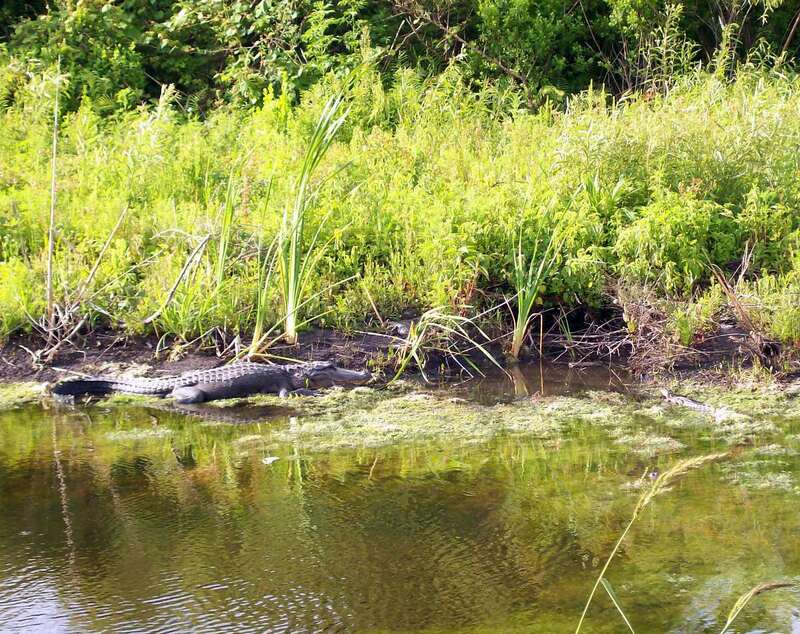 The back story behind the Jewel of the East Coast: Merritt Island Wildlife Refuge and Kennedy Space Center. During the cold war and the "Space Race"; private land was confiscated to create a space center and security buffer/safety zone. I get a chuckle when I review some pretty amazing websites on the Space Program and Kennedy Space Center; and the beginning starts as: "In the 1960"s the Federal Government bought the lands...."
Ok. Sure the properties were purchased, at a maybe a fair price, however the sale was at the point of bayonet. Excuse me if I am not a fan of eminent domain. A Brief history of NASA (official Gov version) without my jaded opinions. 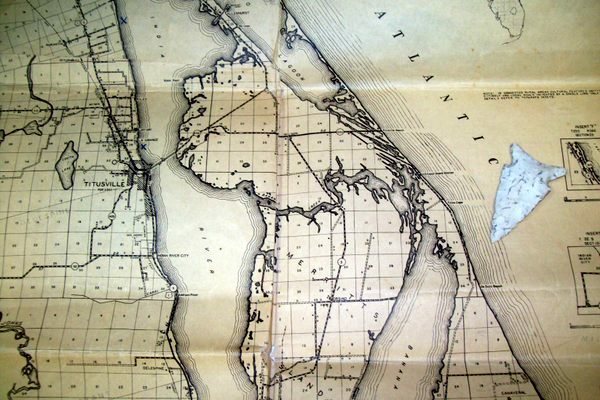 Demonstrates the rich history of the Space coast long before the government land grab. 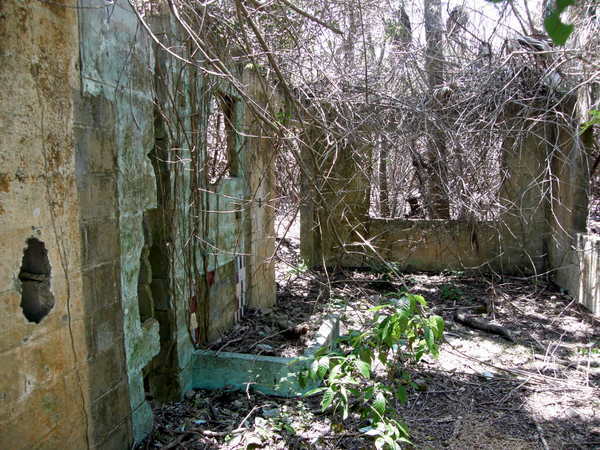 Abandoned homes are sprinkled across the space center. Wooden houses were trucked off the new center. 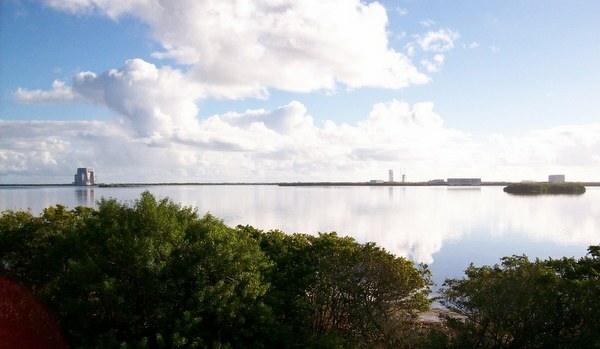 I took this photo from the lightning tower on Launch Pad 39B, looking south towards Cape Canaveral. 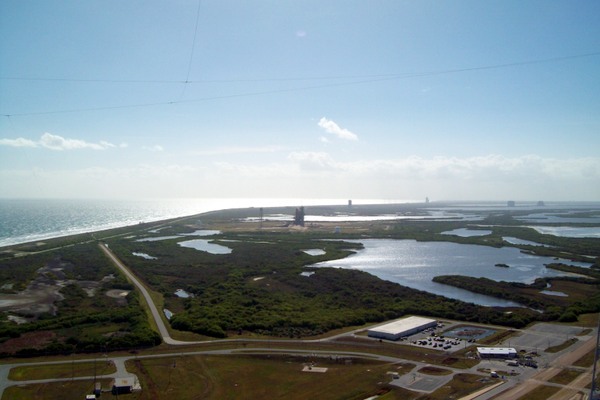 The SpaceX pad, (old Apollo & Shuttle pad 39A) is the nearest launch pad with others in the distance. 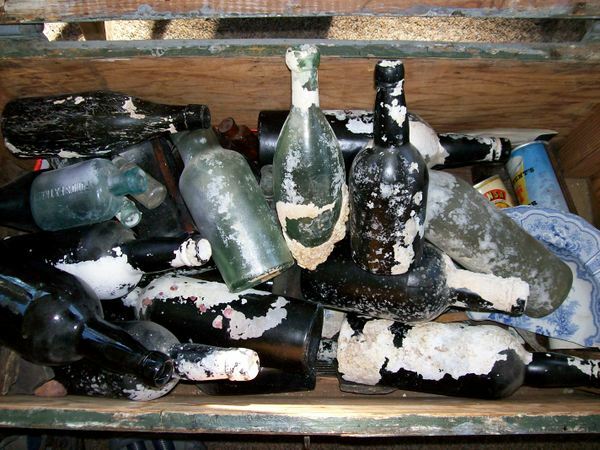 This all was private land confiscated by the United States government during the Cold War/space race. The beaches to the south of the space center may be known as the “treasure coast” due to the Spanish gold coins and Jamaican marijuana that washes ashore………however the real and lasting treasure lies about the wild undeveloped and unspoiled lagoons of the Space Coast, Brevard County. Explanation: during the cold war; private land was confiscated to create a space center and security buffer/safety zone, -various other government organizations jumped to grab their own piece of the pie. And a manatee protection area was also created. Consequently the space center is actually composed of a myriad of chessboard like disparate organizations-each organization getting a chunk of the treasure during this modern land grab. **NASA was awarded a large swath of North Merritt Island for Americas Space Program. 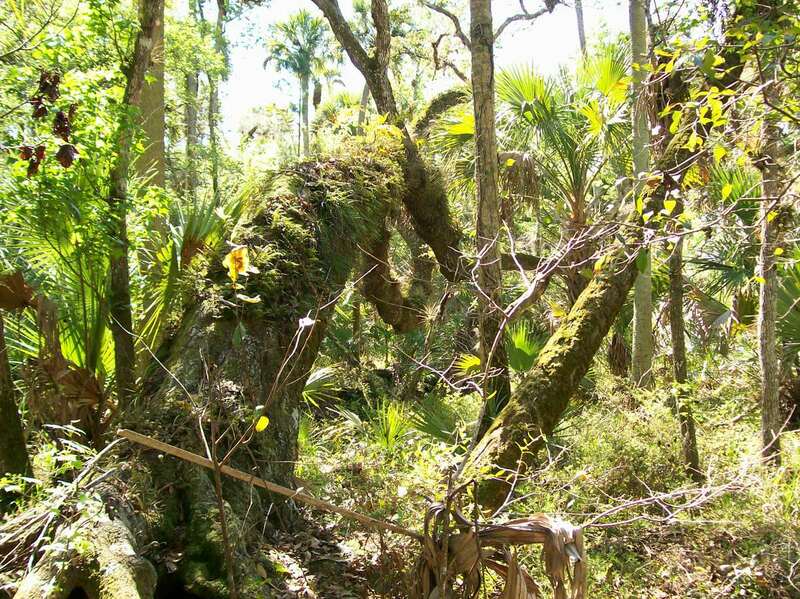 **The state of Florida created Merritt Island wildlife refuge from the wilder sections of Merritt Island. This includes the wetlands of Black Point Wildlife drive-one the most productive bird watching locations in the eastern United States. **Cape Canaveral Air force Station was formed by the United States Air force upon receiving a huge section of the Cape Canaveral coast for their rocket development and launch programs. **Canaveral National Sea Shore was created from the remotest of Atlantic beaches. **Port Canaveral was dredged from sand dunes and two huge canals were cut across north and central Merritt Island. **The Navy got their piece for missile testing. And the Trident basin was created for our nations defense. 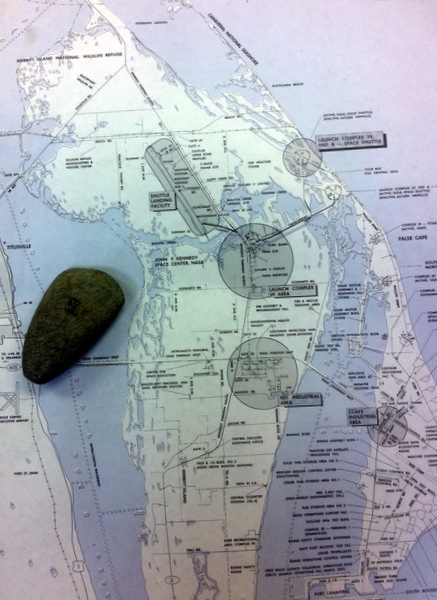 Ais Indian Axe on a map of KSC. The axe is a relic of the of the people who originally inhabited the Space Center Area & whose mounds were bulldozed to create roads and launch pads. "50 years of space", an inspiring rocket and shuttle video beginning with the 60's rocket programs. However no mention of the land theft (my words) to create the Kennedy Space Center and associated lands. The Cape Canaveral-Merritt Island area before the great land grab. "Get off of your land-- this is for the good of us all" someone might have said to those living on this Mosquito Coast. While I may harp on the methods used for this this land theft----No one can argue with the outcome-a national treasure of wildlife refuges, flyway protection for migratory birds, water protection for the upper Indian River Lagoon system and space ports. The islands, marshes, hammocks, beaches and barrier Islands that make up Kennedy Space Center are surrounded by shallow brackish water lagoons officially known as the Indian River, the Banana River and the aptly named Mosquito lagoon. Tides? Except for the far north sections of Mosquito Lagoon, Port Canaveral and Sebastian Inlet to the south; the waters of the space coast are not generally affected by the lunar tidal cycles-they are however greatly affected by the actions of winds……..-one always has to be on guard for drastic wind changes. Looking south from the No Motor Zone. Sea of Glass, no wind-Don't let that fool you the winds can and will shift drastically in a hour. Confusing Jurisdictions and overlapping rules. One of the negative or rather confusing aspects of the space coast waters being in the jurisdiction of so many organizations is the bewildering assortment of restrictions on the use of the space center of waterways. The restrictions range from complete off limits to open the public at all times. Other locations are subject to restrictions on gasoline motors, duck hunting access or closed during rocket launches-for the safety of the general public. I hope my related pages will shed some light on these mysteries of rules and regulations. "I hope"
North Banana River: One side belongs to the USAF and one side to NASA. Both will arrest you if you step ashore. Final note on my addiction to Kayaking Kennedy Space Center: I hate crowds. I hate crowded waters, the noise and trash, I hate the crowded boat ramps and gasoline soaked waters. I hate the inconsiderate who believe everyone in two counties wish to listen to their music and lastly I hate the crowds that scare off every wild creature, be it living in land, air or water. 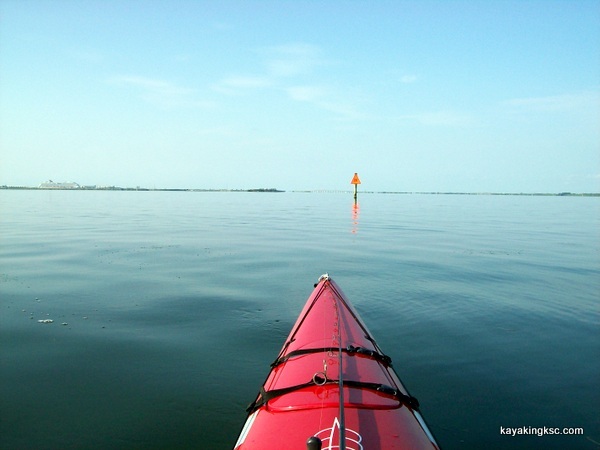 --Trip advisor now lists a staging 230 kayak businesses plying easy waters of the space coast! -And that is okay-there is plenty of room for all. However, with a better boat, one can easily escape the hordes of paddling primates. The jeweled waters of the space coast are one of the few areas where a person can easily escape the crowds of our modern world. Quiet adventure awaits only a blade and smooth boat! Launch Pad 39B and Banana Creek in the background.